Mushroom Stool was born twice: in 1961 and in 2003. Unexpectedly it has become something that makes us happy. “What happened? Why don’t the others come?” We, Amiko Kuraishi and I, were waiting for all the others to come. 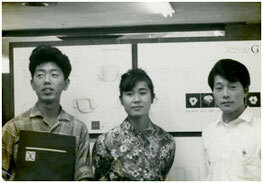 It was in 1960, when International Design Conference was held in Japan and motivated by it, students studying designs and architecture were beginning to meet at student design conferences and participate in some activities and others. We didn’t know why, but no one else came on that day. We were strangers to each other at that time from different departments of different universities. Since that day, however, we have been much involved with each other. The other of us three was KonosukeSohara,who was one of my classmates at Waseda University. When I entered the university, I was introduced to Group H, by professor Hozumi, who had just come back from study abroad. The members of Group H were students one year senior to me and through Group H, our friendship ( Sohara’s and mine) had been promoted, which led us to make Group AMIDA. We happened to know of Tendo Woodwork Furniture Design Competition, and three of us decided to enter for the contest taking advantage of our long spring vacation. We chose “Stool” as our theme as it seemed the easiest and immature students as we might be, we tried hard to fill what was demanded of us and we started to esquisse. We were supposed to use molded plywood, so we didn’t make sketches but instead we esquissed by making paper models cutting and bending Kent paper. Even today, we won’t be able to make a sketch for the model if we are asked to do so. 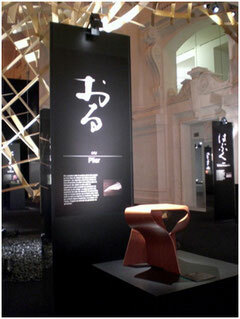 Therefore, our stool was born not from sketches on paper but directly from paper models. We tried a lot of models and among them “Mushroom” was chosen and we entered for the competition with “Mushroom Stool”. 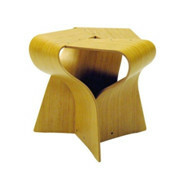 The concepts of “Mushroom Stool, we insisted, were: “Simple construction made of one single component”, “fabrication method,”light weight”, “the beautiful curves and elasticity which come from the qualities of molded plywood”. Our “Mushroom Stool” was accepted in the competition and some time after that good news, an experimental model of “Mushroom Stool” arrived. We were surprised to see it. because it was very much like our paper model in the photograph. However, our design was very immature, the molded plywood used was not thin enough, and it lacked elasticity. We modified our original model putting oil soil on, moderating the twisted curve of the legs, making the vacant space below the seat widen downward, and making the curved line attached to the flat seat more intense . To add elasticity we made molded plywood we used much thinner, from 12mm to 7mm. These modifications were well received by Mr. Inue, department director and the group of splendid woodwork engineers of Tendo Woodwork company, and thus our Mushroom Stool was born! There was a party celebrating our success at the competition in Tendo, Yamagata prefecture. There was a big pile of famous Yamagata cherries on the table. I remember vividly even today how delicious they were. On July 23rd of the same year we had a drinking party at Mr. Fukumura’s flat to celebrate our success. He was a member of AMIDA group. He wrote in his diary. “Yamanaka and Sohara’s stool was accepted at a competition. It was made through their spring holiday researches. We had a drinking party at Dojunkai Edogawa Apartment (Mr. Fukumura’s flat). A part of their prize money was allotted to the party.” This note reminds me of our happy days long ago. Although our Muchroom Stool was born with such happy episodes, it was not commercialized for some reasons or other and it was put away deep into the storehouse. Afterwards in 1965, Amiko and I go married and soon after Sohara married Itoko-san. Our first experimental Mushroom Stool model sat quietly in the corner of our living room and was forgotten. “It’s a good idea. Of course we’d like to. But what has made it come about?” I asked. Thus Mushroom Stool has started again. It’s really forty-one years since the design was accepted at the competition. We were of course surprised and at the same time delighted, and were happy to live long enough to hear of such good news. There were some problems, however, we had to solve to reissue Mushroom Stool. 1) To get more stability as a chair. 2) To make the triangle hole on the top smaller. 3) Can the screws on the top be taken off? 4) What material to use for last coating. Tendo Woodwork Company wanted us to fulfill all these modifications in time for the exhibition of 2002 IPEC21 to see how the public would respond to it. In order to meet their demands we worked hard in a limited time and completed the modifications. The responses at the exhibition were beyond our expectations. It especially attracted the attention of young people. A lot of questionnaires were answered. There were a lot of press interviews, too. Some reported with such a headline as “ a visionary masterpiece has been reissued”. The TV program “EZ! TV Fascinating Design Mid-century” by Fuji Television was especially very influential and Mushroom Stool rapidly became popular among those who were interested in furniture. We sold more than 200 copies that month. My wife Amiko’s father was an artist. When we were students, he sometimes let us use his atelier, where we would work hard deep into the night to create our works for competition. On such occasions he would be watching us working with kind smile. There was once an exhibition of his paintings at Niigata City Art Museum, and a Mr. Fukashi Sugita, doctor from his native town, Joetsu-shi, started to collect his paintings. In 2007 Mr. Sugita built an art museum called “Juka Art Museum”, where Takashi Kuraishi’s (Amiko’s father) paintings and Mr. Saburo Saito’s chinas were to be exhibited. While building the museum, Mr. Sugita thought of putting chairs in someopen spaces where Kuraishi’s paintings would be displayed. 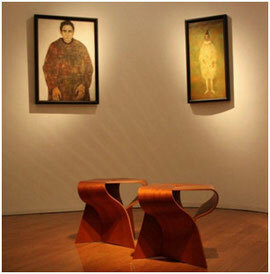 He chose by mere chance two of our Mushroom Stool from among all the chairs in the world! 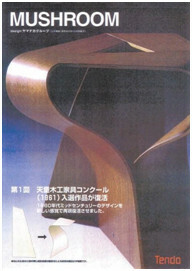 Mr. Sugita was very much surprised to hear afterwards that one of the designers of the chair was Mr.Kuraishi’s daughter. Needless to say we were surprised,too. Amiko’s father must have unknowingly introduced Mushroom Stool to Mr.Sugita. In May, 2009, we received an e-mail from Mr. Saito at Tendo Woodwork company. The e-mail said that Mushroom Stool would be put in the permanent collections of the Decorative Art Museum in Paris and that they need some data for that. “What is it all about?” Further more information told us that JETRO and the Decorative Art Museum together had held an exhibition named “Sensitivity of Japan”, and that Mushroom Stool had been exhibited at the main room, which received a lot of response. 2) What philosophy we came to attain for design in the process. How the philosophy is expressed or reflected in Mushroom Stool. “ A chair when we sit on it is functional furniture, but when no one sits on it, itstands as an object.”When we entered the competition we started with the above concept, that is, we would look upon the stool as an object and tried to get ideas to express our concept. We didn’t draw designs on paper but we designed by cutting common paper with scissors or bending and folding it. Such a form, therefore, didn’t come from plane designs but from cubic designs. We didn’t aim at a fanciful form but when we were molding, we considered quite naturally the qualities of molded plywood and the processing methods congenial to it. As a result of these , such a form was born. However, it could not be commercialized at that time because of the immature technology at that time. It is a great pleasure for us designers, therefore, thatthe development of computer technology nowadays has at last made the commercialization of our design possible after forty-two years. We named this stool “Mushroom”, and we hope our sensitivity which has been fostered in our daily lives will be inherited long years to come, for we think traditions are not found in concrete objects but in the philosophy and sensitivity which exist behind them. In October, 2009, we received through Tendo Woodwork company, the certificate from the Decorative Art Museum with the president’s signature in it,notifying that Mushroom has been included in their permanent collections. We decided to visit the museum commemorating this special occasion and started to make plans for it. We met whenever we had time and discussed our happy plans. We were rather busy at that time and so we agreed that our visit would be in autumn the next year ( 2010). 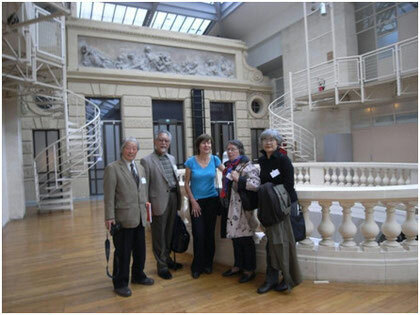 In September, 2010, Mr. and Mrs. Sohara left for France and enjoyed seeing some of the sights there and we visited Northern and Southern Europe, making architectural researches there. We met at Paris and visited the Decorative Art Museum together. During our visit to Paris, a French lady Monichelped us with French and we had a wonderful time. Monic used to study Japanese culture and she helped us a lot. We asked Ms. Dominic, deputy president of the museum, who is in charge of furniture, how our Mushroom had been evaluated and what was the reason it had been selected as one to be included in the permanent collections. She said: there are two points for which it was highly evaluated. One is that it is beautiful, an excellent example of midcentury (1950s and 1960s) designs. The other is that the manufacturing skill is superb and very well processed. We were very much pleased with her answers and finished our happy visit with the snapshot of us five. The Decorative Art Museum in Paris is very unique. It preserves and exhibits all kinds of daily commodities. It has also enterprises to transmit such things to the coming generations. We were impressed how proud the French are of their own culture. We heard that Monic likes Japanese Sake, and some of Japanese food, like NATTO and MISO, so we brought “YAMAUNI” from Kumamoto prefecture as a present. I’d like to introduce one related to Mushroom Stool at the end of this essay. At the end of our journey, we visited Italy and in the train from Venetia to Verona, we met a group of Italian students studying architecture. We are not good at English but using the digital cameras we could somehow manage to tell them that the purpose of our visit to Europe was to see our Mushroom Stool recently included in the permanent collections of the Decorative Art Museum in Paris.